Need a quick Junior High science lesson plan? If so, watch this 2-minute clip for an easy science lesson plan. Cover the magnet with the sheet of paper. Sprinkle iron filings on top. Observe your students- all of them, even the serious ones- play with child-like wonder. Invisible lines of force. Amazing how 3 simple materials produce this. Your junior high students might have guessed that the iron filings would attract to the magnet. But what they weren’t expecting was how magically fun it would be watching the filings line up the way they do. What’s going on here? Each little iron filing has a slight magnetic charge on it, one end being positively-charged and the other negative. 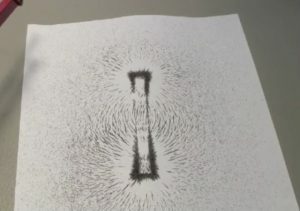 When the iron filing lands on the paper the lines of force from the magnet cause each filing to orient itself according to that. That’s what shown in the picture. Or you could skip the explanation and tell them it’s magic. Set out everything you need the day before. And double-check that you have enough of everything (I always put out an extra or two; things happen in junior high, right?). Put a bit of iron filings inside a zipper-seal baggie, cut a tiny bottom corner off and have them pour through that. That’ll keep their hands and the floor cleaner and make them pour more evenly. When finished, they need to slide the filings from the paper back into the baggie. We all know you’ll get nothing close to 100% back, but you might get most of it. Also let them know they have 5 minutes to do this. That gets them more focused so they don’t play around (as much); and then, when time’s up, they’re ready to move on. This junior high science activity goes great just before showing the Nova video “Magnetic Storm“. Below are LOTS more cool science lessons you can do with your students.